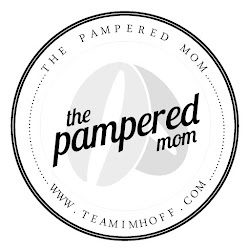 The Pampered Mom: Happy Easter! Happy Easter from the Imhoff's! Today we're going to church, relaxing & of course, having our own Easter egg hunt! Pictures to come of course. Saturday we were able to dye and decorate our eggs, definitely an experience with a two and a half year old! But I love that Braeden was old enough to enjoy it! You should see the massive amount of stickers covered the eggs with! And as a side note, I used lemon juice this year instead of vinager. I LOVED using lemon juice, it made my house smell lemon fresh! Great idea about the lemon juice! You know, we didn't even attempt egg dyeing--ugh, we could barely decorate the Bunny Hut!